Ever since I made the Snicker’s fudge in May, I’ve been dreaming of how else I could use popular candies in baking. 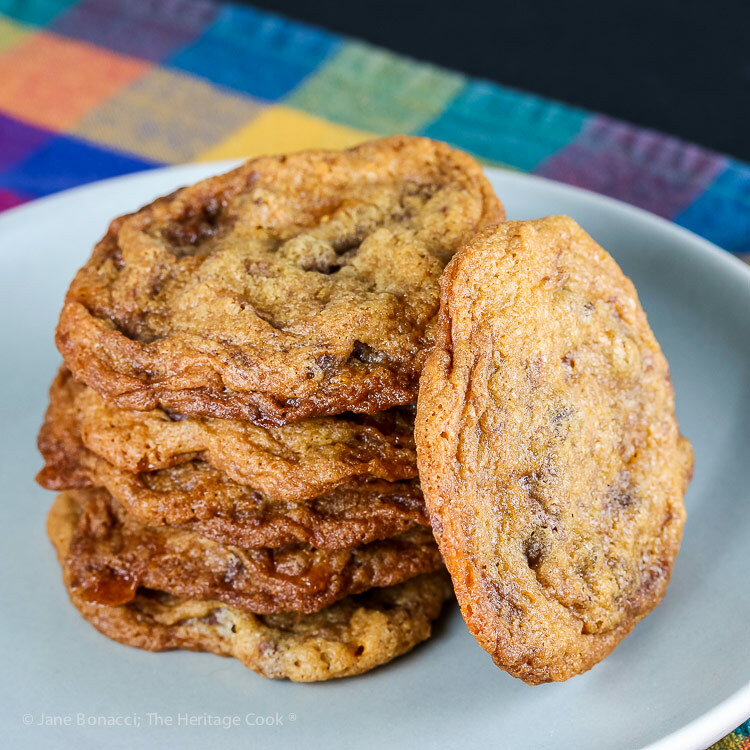 Then I saw a bag of Butterfingers and knew what I was going to make for the second recipe in this year’s Choctoberfest – Butterfinger Chocolate Chip Cookies! These Butterfinger Chocolate Chip Cookies are the perfect combination of creamy and crunchy, peanut butter and chocolate packed into our favorite cookies! I dare you to eat just one – I kept going back for just one more bite, LOL. These cookies are perfect for Halloween because the candy melts unevenly. Lumpy and bumpy, I like the funky shapes, they reminded me of blobs that would be apropos for Halloween parties. The Butterfinger bars will crumble as you chop them, but that is fine. The flavors are distributed throughout the cookies via the shards, giving you a beautifully blended combination in every bite. Just add them in at the same time as the chocolate chips and beat them in with your mixer. Use a spring-loaded scoop to quickly portion the dough. I use mine regularly, have them in several sizes, and they make quick work of getting trays of cookies ready for baking! Choctoberfest is a week-long celebration of everything chocolate. Over 100 bloggers are sharing their favorite chocolate recipes, both sweet and savory! To make it easier for you to find their posts, just check out the blog hop at the bottom of the page and the list of participants on Monday’s post. And don’t forget there is a Giveaway for a prize package worth over $400! Entry instructions are on Monday’s post, click here. A winner will be drawn on October 21, 2018 and contacted via email. Good luck! I hope you enjoy these Butterfinger Chocolate Chip Cookies – buy an extra bag of Halloween candies and set them aside to make these cookies. You will thank me! Butterfinger bars are gluten-free, but only in fun size, singles, and share pack (Butterfinger Bites, Butterfinger Minis, Butterfinger Cups, Butterfinger Crisp, Butterfinger Giant Bars, and special holiday-shaped Butterfinger items are NOT considered gluten-free) … Resourced from: Very Well Fit and from Celiac.org. Chop each "fun size" Butterfinger bar into 3 or 4 pieces. Set aside. Line 2 baking sheets with parchment or Silpats. Preheat the oven to 375°F. In a medium bowl, whisk the flour, baking powder, baking soda, and salt together. Set aside. In the bowl of your standing mixer, using the paddle attachment, beat the butter and both sugars together until fluffy, about 2 minutes. Add the egg and vanilla and beat until just combined. Scrape the sides and bottom of the bowl. Add the dry ingredients and beat until just incorporated and there are no white streaks in the dough. Scrape the bowl again. Stir in the chocolate chips and Butterfinger pieces. Using a 1-1/2 inch scoop or round tablespoon, drop the dough about 2 inches apart on the prepared baking sheets. Bake in the preheated oven for 10 to 12 minutes until golden brown. Let cool a few minutes on the baking sheet to firm up before using a spatula to transfer the cookies to a wire rack to cool. Here are more recipes from Choctoberfest just for you, just click on the InLinkz link below to see a photo array of delectable options to choose from! « Giveaway and Reese’s Brownies for #Choctoberfest!